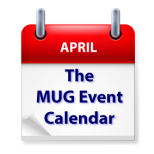 On this week’s MUG Event Calendar, Joe Kissell will visit a California group and Photoshop diva Katrin Eismann will present to a New York Group. Siri will be the featured topic at a Michigan group, while your social media “diet” will be discussed in Connecticut. Other topics on this week’s agenda include buying and selling online, editing photos with Photos, FileMaker Pro 13 and Apple products in medicine.